In this video, Dr. Huntoon discusses the cause of ALL disc herniations and what you need to consider when being told you have a disc. True, you may have had a trauma associated with the disc herniation. Enough trauma to damage your disc and cause it to rupture? Certainly. But that only happens AFTER something compromises the integrity of the strongest tissue in the body. This, you medical doctor will never address and your condition is doomed to become chronic. A herniated disc refers to a problem with one of the rubbery cushions (disks) between the individual bones (vertebrae) that stack up to make your spine. A spinal disc is a little like a jelly doughnut, with a softer center encased within a tougher exterior. Sometimes called a "slipped disc" or a "ruptured disc," a herniated disc occurs when some of the softer "jelly" pushes out through a crack in the tougher exterior. A herniated disc can irritate nearby nerves and result in pain, numbness or weakness in an arm or leg. On the other hand, many people experience no symptoms from a herniated disc. You can have a herniated disc without knowing it — herniated discs sometimes show up on spinal images of people who have no symptoms of a disc problem. But some herniated discs can be painful. The location of your symptoms may vary, depending on where the herniated disc is located along your spine. Most herniated discs occur in your lower back (lumbar spine), although they can also occur in your neck (cervical spine). A Disc herniation, from a medical perspective, is thought to be most often the result of a gradual, aging-related wear and tear called disc degeneration. The theory goes, as you age, your spinal discs lose some of their water content. That makes them less flexible and more prone to tearing or rupturing with even a minor strain or twist. What results from this theory is, most people can't pinpoint the exact cause of their herniated disc. Sometimes, using your back muscles instead of your leg and thigh muscles to lift large, heavy objects can lead to a herniated disc, as can twisting and turning while lifting. Rarely, a traumatic event such as a fall or a blow to the back can cause a herniated disc. Appreciating that your disc covering (annulus fibrosis) is 3/8 of an inch thick, and is made of the toughest tissue in the body, stronger than bone and able to withstand huge amounts of pressure and stress. In order for the center of the disc to herniate out from the disc, something has to compromise the integrity of the outer protective covering. This is where the parasite cause comes in. Parasites seem to like to feed off this tissue known as the annulus fibrosis. And when the annulus finally weakens enough, any activity can lead to a disc herniation. Hence, many times there is no specific trauma associated with having a disc herniation, other than normal life activity. Diet. Eating foods high in mercury (tuna, sushi, other seafood) contribute to developing heavy metal toxicity, which attracts parasites to the body. If your pain is mild to moderate, your doctor may tell you to take an over-the-counter pain medication, such as ibuprofen (Advil, Motrin, others), acetaminophen (Tylenol, others) or naproxen (Aleve, others). Many of these drugs carry a risk of gastrointestinal bleeding, and large doses of acetaminophen may damage the liver. If your pain doesn't improve with over-the-counter medications, your doctor may prescribe narcotics, such as codeine or a hydrocodone-acetaminophen combination (Vicodin, Lortab, others), for a short time. Sedation, nausea, confusion and constipation are possible side effects from these drugs. Decrease or eliminate your Tylenol use if these combination medications are prescribed. Drugs such as gabapentin (Neurontin), pregabalin (Lyrica), duloxetine (Cymbalta), tramadol (Ultram, Ryzolt) and amitriptyline often help relieve nerve-damage pain. Because these drugs have a milder set of side effects than do narcotic medications, they're increasingly being used as first-line prescription medications for people who have herniated disks. Muscle relaxants such as diazepam (Valium) or cyclobenzaprine (Flexeril, Amrix) also may be prescribed if you have back or limb spasms. Sedation and dizziness are common side effects of these medications. Inflammation-suppressing corticosteroids may be given by injection directly into the area around the spinal nerves, using spinal imaging to more safely guide the needle. Physical therapists can show you positions and exercises designed to minimize the pain of a herniated disc. As the pain improves, physical therapy can advance you to a rehabilitation program of core strength and stability to maximize your back health and help protect against future injury. Unfortunately, this will not address the underlying cause and because of that, the likelihood of the disc problem returning is high. Surgery: this is the last resort. Only consider this after all else has failed. A very small number of people with herniated discs eventually need surgery. In many cases, surgeons can remove just the protruding portion of the disc. Rarely, however, the entire disc must be removed. In these cases, the vertebrae may need to be fused together with metal hardware to provide spinal stability. Or your surgeon may suggest the implantation of an artificial disc. Over-the-counter medications — such as ibuprofen (Advil, Motrin, others), acetaminophen (Tylenol, others) or naproxen (Aleve, others) — may help reduce the pain associated with a herniated disc. As with all medications, discuss with your medical doctor or pharmacist the potential for side-effects and complications so you know what to expect when taking medication. This is vital for this form of care. Initially, cold packs can be used to relieve pain and inflammation. After a few days, you may switch to gentle heat to give relief and comfort. Too much bedrest can lead to stiff joints and weak muscles — which can complicate your recovery. Instead, rest in a position of comfort for 30 minutes, and then go for a short walk or do some work. Try to avoid activities that worsen your pain during the healing process. Conservative treatment — mainly avoiding painful positions and following a planned exercise and pain-medication regimen — relieves symptoms in nine out of 10 people with a herniated disc. Many people feel better in a month or two with conservative treatment. Imaging studies show that the protruding or displaced portion of the disc shrinks over time, corresponding to the improvement in symptoms. The underlying reason for the disc problem is still residing in the system though and should be considered to truly remedy the situation. This is the number one choice for treatment of a herniated disc. 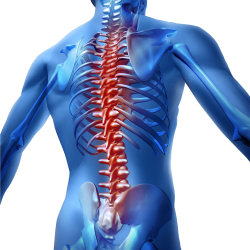 Relieving the pressure on the disc by restoring proper spinal alignment will often allow the disc to shrink. Depending on the chiropractor, some may not want to treat a disc herniation for fear of making it worse. That's when you should consult with a Holistic Chiropractor. Dr. Huntoon has quite an extensive history of remedying disc herniations. By addressing the underlying relationships that lead to and cause disc herniations, Dr. Huntoon has helped hundreds of people avoid disc surgery and has helped them restore and regain their health and lives. Using the 7 Pillars of Health to understand ALL the contributors to your disc herniation(s) is vital for you getting and staying well. Heavy Metals and Parasites are associated with every herniated disc Dr. Huntoon has ever treated. And when these two health imbalances are addressed fully, the disc can heal and the person goes on with their life. Consider this before starting any other form of care. By not addressing these underlying causes, a person may develop additional disc herniations in the same or other areas of their spine. You may have addressed the disc directly with surgery, and the UNDERLYING CAUSE is Still there. Over time, you most likely will develop another disc herniation. Dr. Huntoon can make sure this NEVER happens. Finding a Holistic Chiropractor who is well versed in treating disc herniations is the best option for this condition. Working in conjunction with your medical doctor is important when managing the pain associated with the condition while receiving treatment. By developing a well-rounded, multifaceted approach to addressing all the reasons for the disc herniation by addressing the parasites and the underlying causes of the parasites, while assisting the body to heal through whole food supplements, this will allow the disc to truly heal and the body to have the best chance of a full recovery. Understanding the time commitment involved is important to discuss before making the choice to do this form of treatment. You're likely to initially bring your symptoms to the attention of your family doctor. He or she may refer you to a doctor specializing in physical medicine and rehabilitation, orthopedic surgery, neurology or neurosurgery. Ideally, they should refer you to a Holistic Chiropractor. Having this condition is not fun at all. Being motivated to look for non-conventional forms of treatment is warranted. Working with a Holistic Chiropractor does offer benefits, as using a well-rounded, multifaceted approach to address all the causes and imbalances within the person is necessary. This has demonstrated positive results and full resolution when sticking to a specific treatment plan. Discussing what is involved and the time commitment necessary to having a full recovery is warranted. Avoid eating seafood. When one eats seafood regularly, you increase the likelihood of developing heavy metal toxicity. Heavy Metal Toxicity is the underlying cause of parasites and disc herniations.